Hello Dealsnloot Readers,Ebay has again come up with an exciting deal specially for ‘New users‘ in which they are offering Listed Products at just Rs 199 only on your First Purchase. 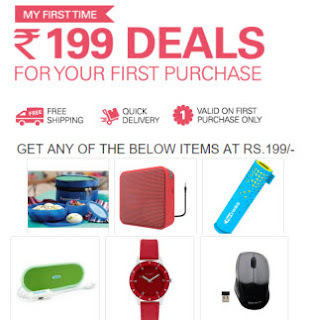 You can buy Speakers, Wireless Mouse, Lunch Box or a Watch at just Rs 199 only. This offer is valid till 10th February 2016. Grab This Ebay Loot Offer and Get Super Loot and Deals. What you can buy in Rs. 199 ? Enter your valid contact email ID and mobile number in the form above. “First Time Buyer” means a User who has not completed successful transaction before on eBay Website. The User must be a First Time Buyer on eBay Website while availing this deal. The User must hold a valid/active email id and mobile number. The User shall share the name, mobile number, email address as requested by eBay under the promotion/campaign. The Promotion Period means: 4th February 2016 10:00:00 Hrs. IST till the 10th February 2016 23:59:59 Hrs. IST. The Promotion is valid only for Users with Registered Addresses in India only (hereinafter ” User/s”). Users shall pay for their transactions only through PaisaPay payment facility of eBay Website. However the Promotion is not applicable on Cash on Delivery [“COD”] as a payment option. A User will not be eligible to participate under this Promotion more than once in any manner whatsoever. eBay shall send a Coupon Code through SMS to the eligible User/s to purchase this product. The Coupon Code will be valid for three days [i.e. from 8th February – 10th February 2016] for redemption. Users can apply this Coupon Code to purchase the product under the Promotion between the above mentioned periods. The Coupon Code will only be applicable for the product under this Promotion and cannot be combined or used for any other eBay promotions on the site. Limited Stock offered by Sellers and shall be valid on First come first serve basis only.